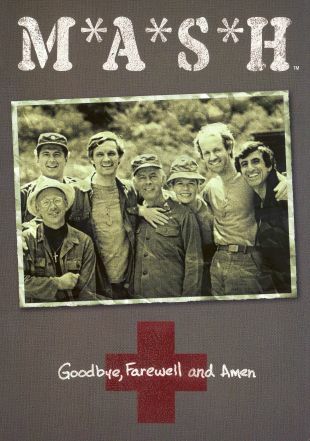 Goodbye, Farewell and Amen was the instant-classic final installment of the long-running TV series M*A*S*H. After nearly three bloody years of combat in Korea (and 11 years' worth of TV time! ), a truce has been declared and the 4077th is going home. News of the cease-fire affects different people different ways. The happiest of the bunch should be Captain "Hawkeye" Pierce (Alan Alda), but he is undergoing a mysterious bout of depression over a horrible incident in his past. Meanwhile, the insufferable Major Winchester (David Ogden Stiers) shows signs of mellowing as he trains a group of musically-inclined Korean prisoners in the niceties of European chamber music. Others who must begin seriously considering a future unblemished by the threat of war are newly married Corporal Klinger (Jamie Farr), newly divorced Major Margaret Houlihan (Loretta Swit), and the hearing-impaired Father Mulcahy (William Christopher). The central mystery of the episode concerns the nature of Captain B. J. Hunnicutt's "special" goodbye to his roommate and best friend Hawkeye. Originally telecast February 28, 1983, the 2 1/2 hour Goodbye, Farewell and Amen was the most widely watched TV program of all time.